When it comes to reading and writing, I need to see the characters, the setting, and the action. I want to readers feel like they're part of the story rather than watching it from the outside. 1. 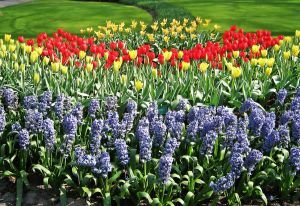 Visit botanical gardens - Yes, folks, I smell the roses, and take in their colors, shapes, and how they blend with other flowers. This gives me a general sense of how gardeners create pleasing vignettes, including water features, birdbaths, etc. Rather than take notes, I prefer photos to refresh my memory. 2. Site Visits - My novel, The Moses Conspiracy, starts off in Washington, D.C., but most of the action takes place in Bird-in-Hand, PA. I chose those two settings for several reasons. A. I've been to both places more than once. more freedom than non-tourist zones in 2025. C. I was able to show interaction between non-Amish and Amish characters. 3. Photography Websites - I soak up photos on http://www.sxc.hu and http://123rf.com. A simple picture can not only help with my setting, but also trigger ideas for an action scene. 4. Social Media - I'm new to Pinterest, but already I'm collecting ideas for settings and clothing styles. Writers: How do you think outside the box when it comes to setting? Readers: What kind of settings do you like in books? Historical? Contemporary? Please share. A mixture of love and guilt drive Lily Young to find her sister. She ignores danger and pursues her goals, while working as a photographer's assistant. Connell McCormick, a lumber boss in Harrison, Michigan, works hard and largely ignores the debauchery around him. Lily forces him to face the ugly truth, and challenges his way of life. Jody Hedlund captured the setting and drew me into Lily and Connell's world. During one action scene, I could almost hear a glass bottle whizzing by my head. There's plenty of danger, romance, and action here for the reader. Jody is on a roll, and I'm looking forward to her next book. Disclaimer: Neither the author nor the publisher provided this book. The opinions expressed are my own, and I received no remuneration for this recommendation. Writers & Readers: Have you read any of Jody's books? Which one is your favorite? I love to decorate. I especially love to find treasures at bargain prices. The lamp in the picture was a yard sale find, and fit my vision for my reading nook. Writing a novel requires a lot of imagination. Not only do we have to develop multi-faceted characters, but also the entire stage upon which they share their story. Where can we get ideas for interior design for our characters' homes? 1. We can find inspiration in our own homes. The above picture became my model for a lamp passed down from Ellie Zimmerman's Mom in my book, The Moses Conspiracy. It's a huge help to have a visual when writing a scene. 2. Stroll through a furniture store, linen department, or any place that sells items for the home. Get a picture in your mind of what styles your characters would choose for their home. 3. Browsing through magazines is another fabulous way to narrow down the choices for our home setting. Writers: Where do you find ideas for your characters' home sweet home? Readers: Where do you get ideas for your own home? 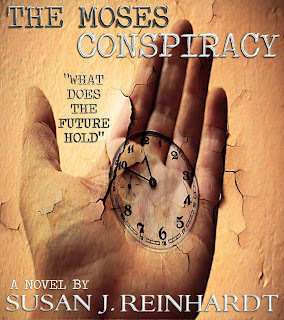 You've won The Moses Conspiracy Blog Tour Giveaway. Thank you for pinning the giveaway on Pinterest. I've contacted you by email and delivered your pdf of the book and the $25.00 Amazon gift card. Thanks to all those who participated! 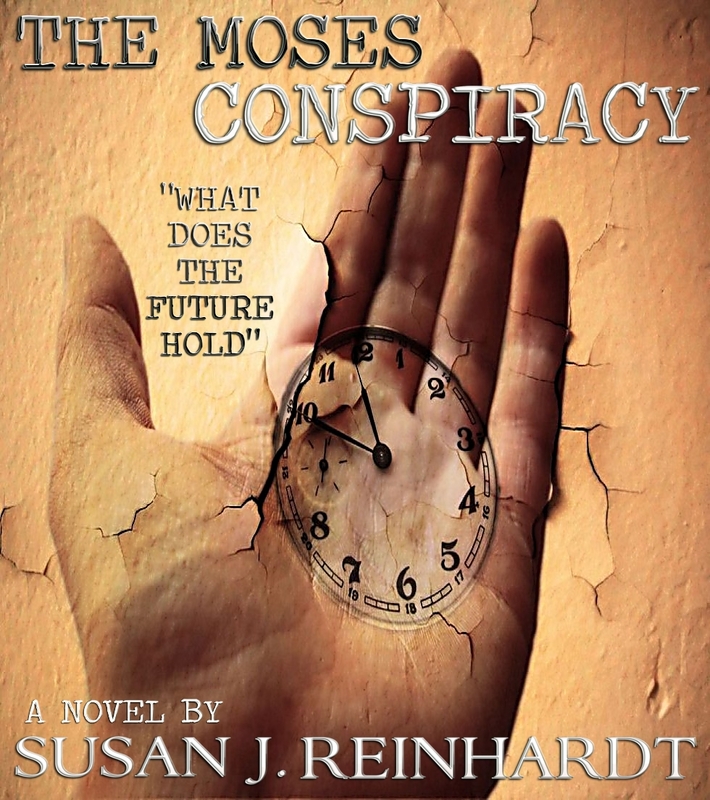 The Moses Conspiracy can be purchased at Amazon, Barnes & Noble, and Kobo. Friday Round-Up - #231 - New Genre Alert? 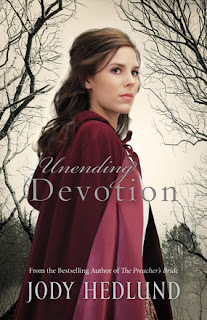 Mary Keeley blogs at Books and Such about a possible new genre for CBA - Baby Boomer Lit. As authors/writers, it's interesting to look at trends and decide if they're something we might consider. Writers: How did you decide on your present genre? Readers: What's your favorite genre and why? Nostalgia, vintage items, and antique shops have one thing in common: ME! I made the shadow box in the picture. I took older items and photos of my parents and made them into a collage. Research doesn't have to be about reading textbooks or sifting through piles of boring clippings to find that one gem. My adrenaline flows at the mere thought of visiting a historical site or an antique shop. There's something about seeing memorabilia from bygone days that makes me rush back to my computer with fresh material. This may seem odd since I'm writing Christian Speculative Fiction. Yet, I've seen how history can impact the future. Decisions and events have shaped our present. So, my friends, go have fun with your research. Sample different cultures, foods, and sights both past and present. Writers: What does your fun research look like? Readers: What activities and hobbies make your heart sing? 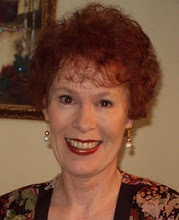 First, we have Jean Fischer, a talented Author and Freelance Writer. We met on Facebook and clicked immediately. Jean is one of my critique partners, and she's dynamite at fixing computer/software problems. Having sat in the editor's chair, her advice on the publishing process always hits the target. She's also a tender-hearted friend, fellow Pinterest enthusiast, and shares many of my hobbies. I hope we meet in person someday. Karen Lange and I met online through a mutual friend, Mary Ann Diorio. She's an online writing teacher, blogger, and aspiring author. We get along so famously that we're collaborating on a book project. She's part of the critique trio you see here, and I value her suggestions and wisdom. We haven't met in person yet, but we're working on it. We've become fast friends, and I can't imagine not having her in my life. Jeanette Levellie and I met through blogging. This multi-talented lady is an author, speaker, blogger, and vocalist. Her insightful humor has delighted thousands. We've had the privilege of meeting in person for a conference, and our friendship has been a huge blessing in my life. Jen truly walks the walk, as well as talking the talk. I doubt if my book would be in such good shape without her editing skills. I'm so grateful for these dear friends. God blessed me with these kind, godly women, all experts in their own right. They've not only enriched my writing, but also my personal walk with the Lord. Writers and Readers: Besides family, who has supported your dreams and goals? Have you made meaningful connections through Social Media? African violets weave in and out of my childhood memories. My mother is a huge fan and always had at least a couple of them in the house. Her enthusiasm has rubbed off on me. Someone gave me a beautiful specimen that is perched on a shelf above my desk at work. 1. They must be watered from the bottom. Get moisture on their leaves, and you might as well throw them on the compost heap. 2. My African Violet sits under a fluorescent light and shows its happiness by abundant flowering. 3. The plants also favor an eastern exposure. If they're in a spot that's too sunny, the leaves will burn. 1. Encouraging words feed our creativity. Please be kind when critiquing or we'll shrivel up like a wet African Violet leaf. Oh, and a little chocolate wouldn't hurt either! 2. Coax us out of our writing cave once in awhile to bask in the great outdoors. Our words will flourish and spill out onto the page. 3. Too much play and not enough seat-in-chair time will have the opposite effect. We'll be tempted to leave the computer dark and gathering dust. The key to both a healthy African Violet plant and a healthy writer revolves around a single word: balance. Writers: How do you keep a balance between family and writing? Readers: How do you juggle the many demands of your life? Jack Clayton's publisher pressures him to write a memoir, but he's not ready to face the skeletons in his closet. Although he's done amazing things in the ministry and produced a best-selling book, the past keeps him in chains. He finally agrees to write his story, and God brings people across his path with wise counsel, love, and forgiveness. Yet, he knows parts of his life can never be transformed. His one true love is married to another man. I loved. No Loved. Absolutely LOVED this book. Chris Coppernoll had me totally engaged in this story from page 1. Not only are the characters believable, but the the nuggets they shared made me think of situations in my own life. I got this book free for my Kindle, but I'm going to purchase a print copy. 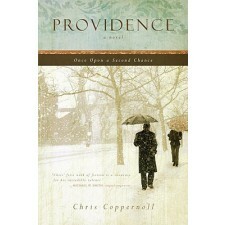 Providence: Once Upon A Second Chance is too good not to share with others. Disclaimer: Neither the author nor the publisher provided any payment to recommend this book. All opinions expressed here are mine and given without reservation. Writers: Do you enjoy books where the main character is a writer? Why? Readers: Do novels ever grab your heart and make you think about issues in your life? Please share if you feel comfortable. With all the social media sites out there, how do you decide which ones will be fun and effective, but not take up every waking moment of your life? My friend, Miriam, dragged me onto Facebook. I'm glad I listened to her because I've connected with family and friends. It's a quick way to communicate important news flashes, prayer requests, and share pictures. While blogging is still my favorite venue, Facebook has added another dimension to the relationships planted there. 2) What are bloggers saying about the site? I'd say I first heard of Pinterest about 2 years ago. (Yeah, I'm a little slow jumping onto new trends.) It seemed like everyone was talking about it in the blogosphere. 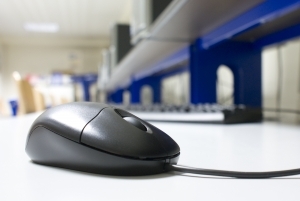 Another friend, Jean Fischer, is on top of technology and wrote a post about Pinterest. By this time, curiosity was building like steam in a pressure cooker. Oh, did I mention that I met Jean on Facebook? 3) What kind of social media sites are recommended by publishers? Helping Hands Press, my publisher, is super big on social media. Pinterest, Facebook, Goodreads, and Twitter are on the top of their list. I signed the contract, and added Pinterest and Goodreads to my daily rounds. I love magazines and have clipped recipes and articles over the years. Pinterest is a virtual bulletin board. I can "pin" items I like on my boards for future reference. Right now, I'm collecting gardening tips. When the weather turns balmy, I'm ready to plant my flowers and veggies. New connections are being forged with people, who might not venture near my blog or become a Facebook friend. The best part: I'm enjoying the ride. Writers: How did you select the social media sites you frequent? Readers: What draws you to Facebook or Pinterest?